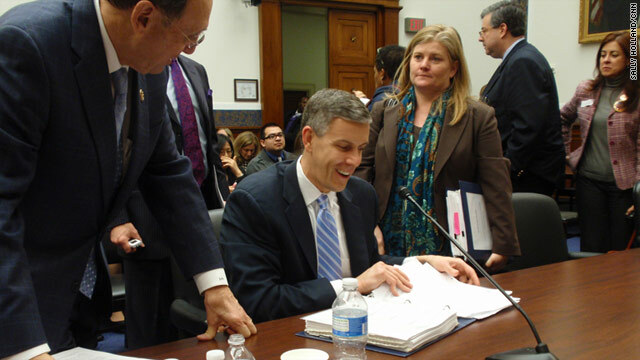 Education Secretary Arne Duncan, center, says that four out of five schools in the United States will not make their "No Child Left Behind" benchmarks by 2014. Washington (CNN) -- Education Secretary Arne Duncan said Wednesday his department estimates that four out of five schools in the United States will not make their "No Child Left Behind" benchmarks by the law's target year of 2014 -- and when the test scores are counted for the current school year, numbers could show that U.S. schools are already at that failure rate. He blamed that failure rate on the law itself, not on schools. "This law has created dozens of ways for schools to fail and very few ways to help them succeed. We should get out of the business of labeling schools as failures and create a new law that is fair and flexible, and focused on the schools and students most at risk," Duncan told the House Committee on Education and the Workforce. Under the No Child Left Behind law, originally passed in 2001, all students are expected to meet a level of "proficiency" by 2014. Because standards under No Child Left Behind are higher from year to year as 2014 approaches, the percentage of schools that are not meeting "Adequate Yearly Progress" could rise from the current level of 37% to 82%, Duncan said. Duncan pointed out that federal law requires states and districts to "implement the same set of interventions in every school that is not meeting AYP, regardless of the individual needs and circumstances of those schools." Under the Education Department's estimates, 82% of America's schools "could be labeled 'failing' and, over time, the required remedies for all of them are the same -- which means we will really fail to serve the students in greatest need," said Duncan. "By mandating and prescribing one-size-fits-all solutions, No Child Left Behind took away the ability of local and state educators to tailor solutions to the unique needs of their students," Duncan said calling the concept "fundamentally flawed." Duncan was on Capitol Hill to both push for the reauthorization and revamping of the No Child Left Behind law, and to defend President Barack Obama's budget request for 2012. The 2012 budget request comes to $77.4 billion -- an increase of $4.5 billion over the 2011 request. Republicans on the committee questioned any increase in the budget in the current economic climate. Committee chairman Rep. John Kline, R-Minnesota, said in his opening remarks, "As we work to answer the question about the appropriate role for the federal government in education, one thing is for sure: it must be less costly and less intrusive." Rep. Duncan Hunter, R-California, asked the secretary if he though he could be successful without an increase in funding saying, "If you cut the right way and put the money into the systems that you know work, could you do that?" The education secretary answered, "We have to do that, anyway, and I continue to think we under-invest" compared to higher-performing countries.